At Team B's National Tour Concert on July 10th, Masuda Yuka announced that she will not be participating in AKB48's Tokyo Dome Concerts. She had previously announced that she would not be partaking in the Janken tournament to decide the senbatsu members for AKB48's 29th single. 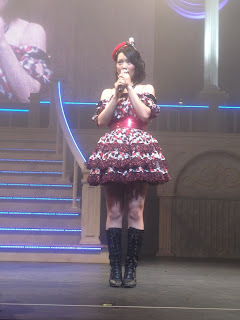 The reason for her withdrawal is to concentrate on rehearsals for Miyamoto Amon's version of The Wizard of Oz, which starts on September 28th, 2012. Yuka was cast in the lead role of Dorothy in the musical. The musical will tour Yokohama, Osaka, Tokyo and Nagoya until November. Performing a concert at Tokyo Dome has long been a dream of AKB48, so for Yuka to withdraw, this musical must be really important. I wish her all the success and hope this acts as a launching point for the rest of her career.